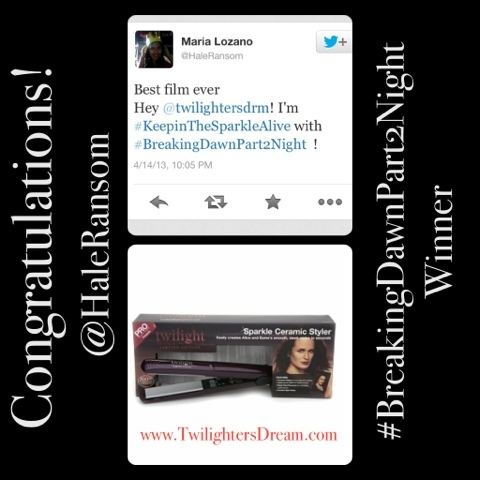 Congratulations to both of the winners from last nights #BreakingDawnPart2Night Giveaway! 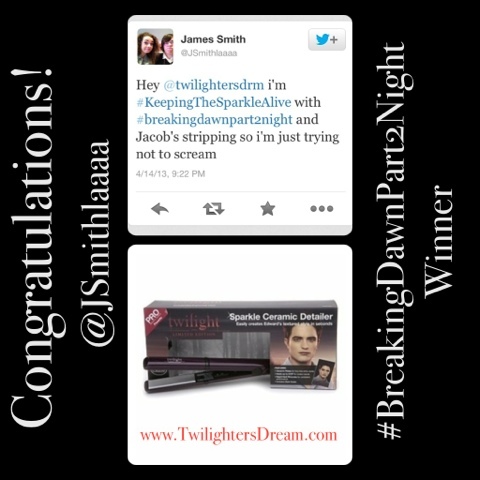 @JSmithlaaaa won a Edward Sparkle Ceramic Detailer and @HaleRansom won an Esme Sparkle Ceramic Styler by Twilight Pro Beauty Tools! Please send me a direct message on Twitter or email me at twilightersdream@gmail.com so I can send you your prize! Thank you to everyone who watched, tweeted and participated in last nights Breaking Dawn Part 2 Twitter Party. I'd also like to say a HUGE THANK YOU to @spunk_ransom @RobstenDreams for participating and especially @TwilightPoison for organizing this whole Twitter event! We all had a fangtastic night!! Thank you also to all my new followers on Twitter! Welcome!! We're #KeepinTheSparkleAlive together!